November 21, 2015 (Ramona) – The Federal Bureau of Investigation (F.B.I.) 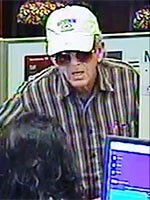 and the Sheriff’s Department seeks public help to locate an elderly white man, age 60 to 80, who robbed the Bank of America at 1407 Main St. in Ramona Thursday morning. He gave the teller a note demanding cash around 11:17 a.m. and brandished what was believed to be a handgun.